Nothing on this little family adventure of ours — and I mean nothing — makes Leo and Hazel happier than having other kids to play with. 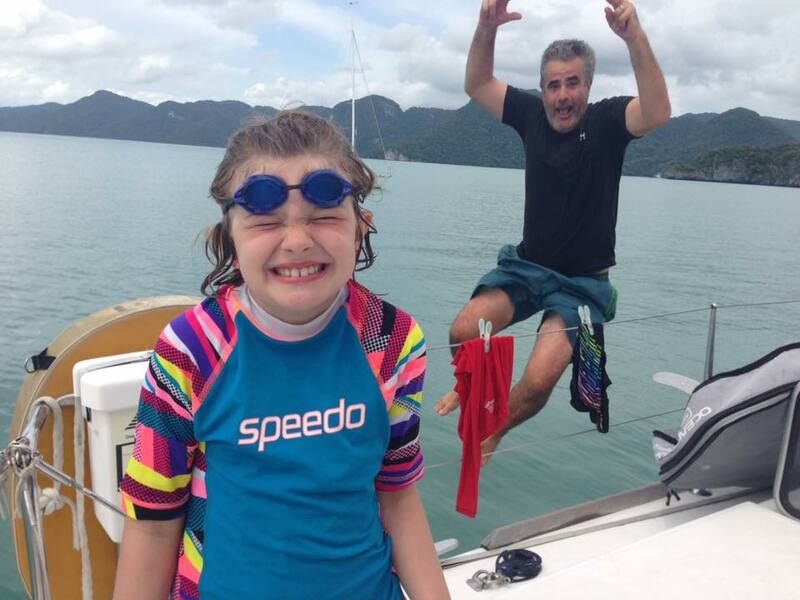 Sophie is still in Telaga on the Malaysian island of Langkawi, and there has ben a lot of happiness on our boat over the last couple of weeks. No broken bones, either. As I’ve mentioned before, Jenna and I always assumed that we would be surrounded by other kid boats for the last two years, but that hasn’t happened as often as we had hoped. This is partly due to the timing and nature of our major routes. For our big Pacific crossing, we departed from San Diego, and apparently many kid boats depart from Mexico. We also departed in early March, which placed us a month ahead of the main fleet doing the crossing to the Marquesas. 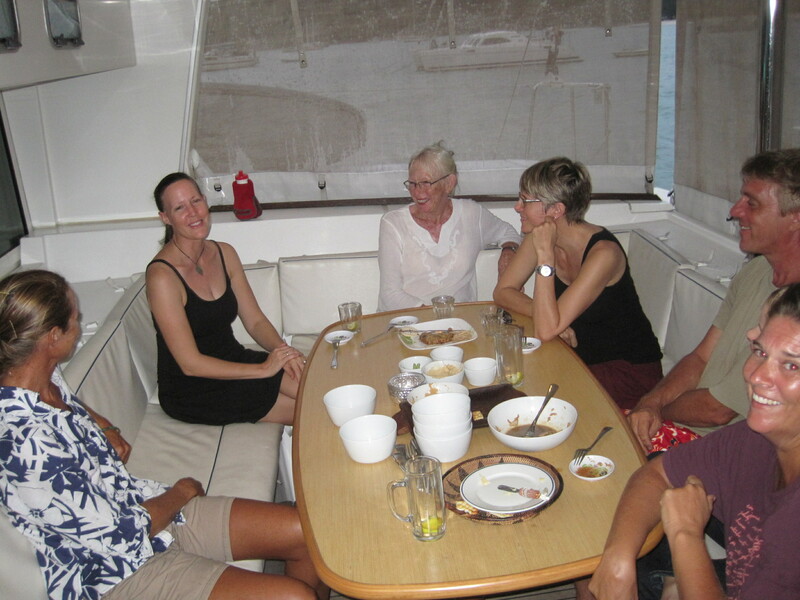 So for most of our 2013 summer crossing of the South Pacific, we hung out with more Swedes than with kids. At least until we hit Fiji. From my perspective, Swedes on boats are as fun as kids. But I think Leo and Hazel prefer companions their own size. Most of our Swedish friends were much bigger. Especially the Swede named Kid. For our passage over the top of Papua and into Indonesia, we buddy-boated with Per Ardua and their three kids (and two awesome parents). It was a wonderful and happy experience for all of us, especially for Leo and Hazel. But we had to move on and have been pretty much in a no-other-kids cruising zone for five months until we hit Penang and met the families on Love Song and Boatylicious. It was great for Leo and Hazel. 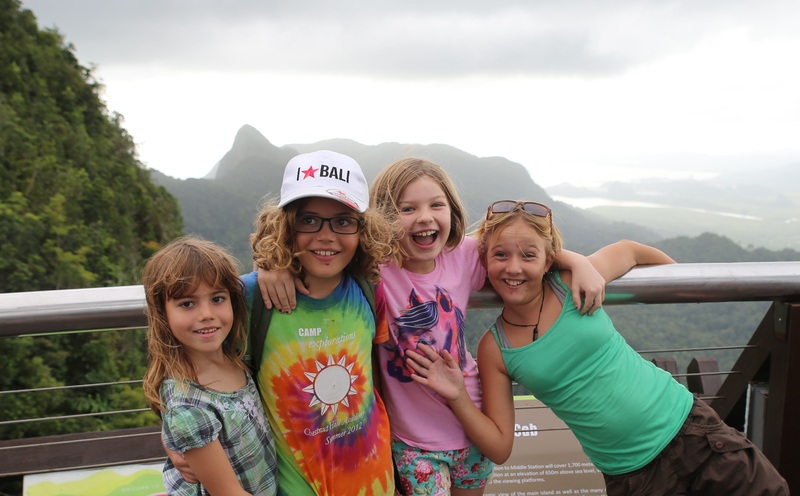 Now that we are up in the Langkawi-Phuket cruising belt, the kid happiness for Leo and Hazel keeps getting better. Our first source of Telaga kid-happiness is a lovely young girl named Jana from the sloop Momo. 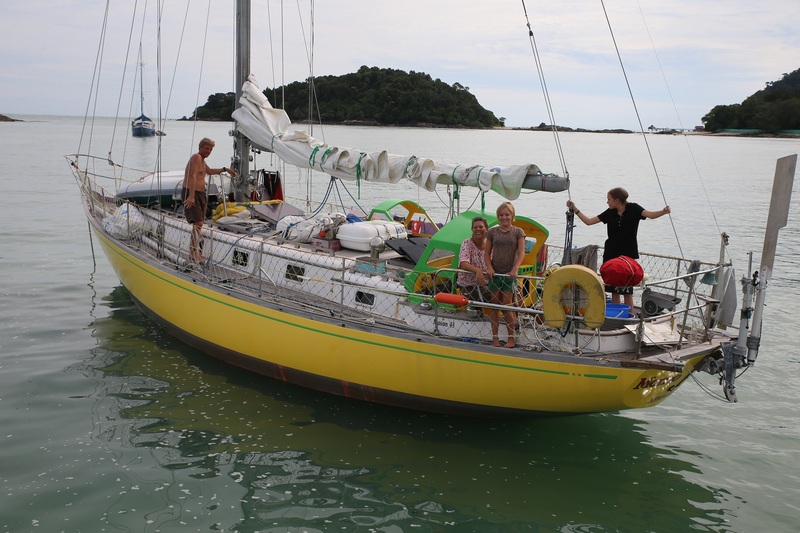 Her family was in the process of getting their boat ready for an Indian Ocean crossing. Jana basically moved onto Sophie for a few days, and her presence made everyone on our boat happy. She spent a day on a deserted kid island with Leo and Hazel, she accompanied us into town a few times, she made forts with Hazel, and she even played board games with me and Jenna. After a few days she felt like a part of our family, and we didn’t want to give her up. Unfortunately the rest of Jana’s family, shown above, love her a lot and weren’t quite willing to give her up. And in case you are wondering, Momo is a Mason 43. We spent so much time enjoying Jana’s presence on Sophie that we neglected to pay as much attention to the weather as we normally do. At the time there was a typhoon forming over Japan and China, and that system started sucking all of the air out of this region. So we wound up getting hit by multiple squalls over a two week period. It resulted in some new adventures. To provide context, here is a photo of Telaga taken from a local mountaintop. There is a very protected marina to the left, connected by a boardwalk to a row of outdoor restaurants (the red-roofed buildings). Outside of the harbor is an anchorage protected from the Malacca Strait by two islands, which are man-made. The anchorage itself is about 12 feet deep and filled with very soft mud formed by the dirt that was dug up from the land to form the harbor. The result is an anchorage with a very weak ability to hold an anchor. We found this out as we were returning to Sophie on the dinghy with Jana. A rain shower and a forty knot gust from the side hit us just as we were unloading groceries from the dinghy, and Sophie surged sideways and popped her anchor out of the mud. I was the last one in the dinghy, which was sucked under Sophie’s bridgedeck as our big sailboat started to surge through the harbor, dragging a now useless anchor behind us. Jenna and I were pretty cool and calm about what happened next. The dinghy was still tied to Sophie’s stern, so I was able to get out of it. Jenna went up top to pull the cover off the steering wheel while I went inside to start Sophie’s diesel engines. We were able to get the boat under control and avoided hitting the Russian catamaran behind us. We reset our anchor while every other boat around us watched warily. And we weren’t alone … three other boats in the harbor popped their anchors during this squall! The harbor was a mess until the weather calmed down and the squall passed. So we proceeded with our plans for a little sundowner party on Sophie, and the crews from four boats came over for some drinks and the last of our yellowfin tuna. We also had a lot more anchor rode out to avoid another dragging incident. 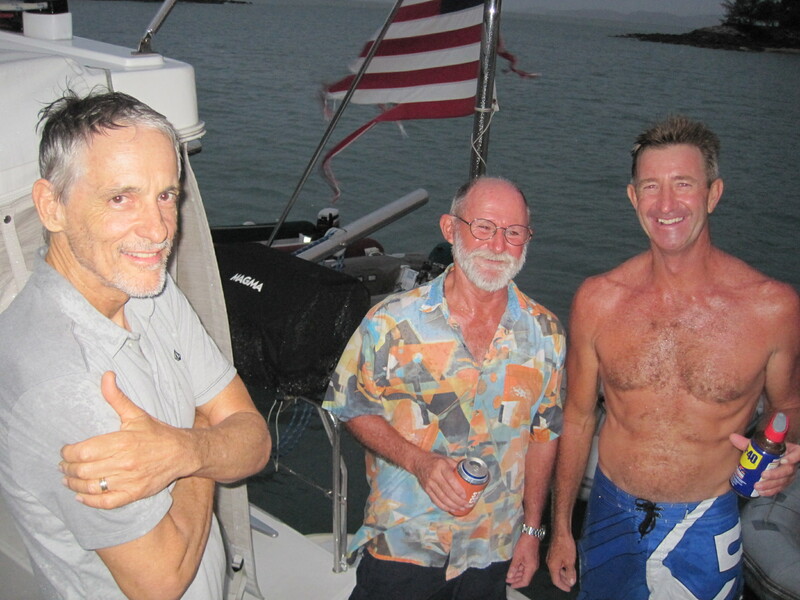 Two more squalls came through during the party, and the second one flipped the dinghy of the Seattle sloop Before while the dinghy was tied to Sophie’s stern. The men all jumped up into the rain to right the dinghy. Mike the surfer dude ripped his shirt off, I grabbed the WD-40, and within 10 minutes we had the water out of the dinghy and its outboard running smoothly. And yes, Sophie now needs a new flag. Three more squalls came through that night, and Jenna and I didn’t sleep a wink. This was the first time Sophie had popped her anchor in 32 months, and we were quite wary about it happening again. Fortunately, we had a reservation for a dock the next day and were quite happy tie up in the protected part of the harbor during such unsettled weather. We had booked the dock in anticipation of more kid happiness in the form of our friends Misti and Abbi who were coming up from New Zealand for a visit. Since the weather in the anchorage remained crappy, Jana moved back onboard Sophie as well. 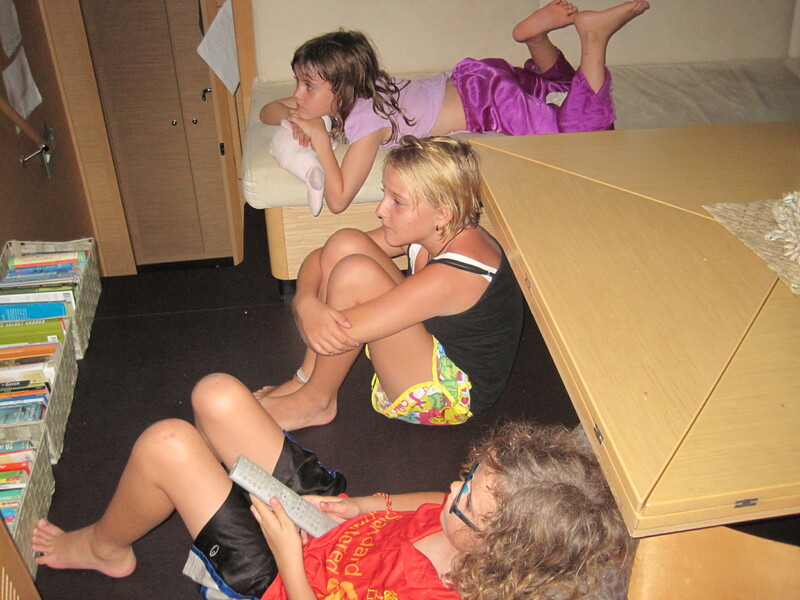 So for the next two blissful days, we had four children living on the boat. 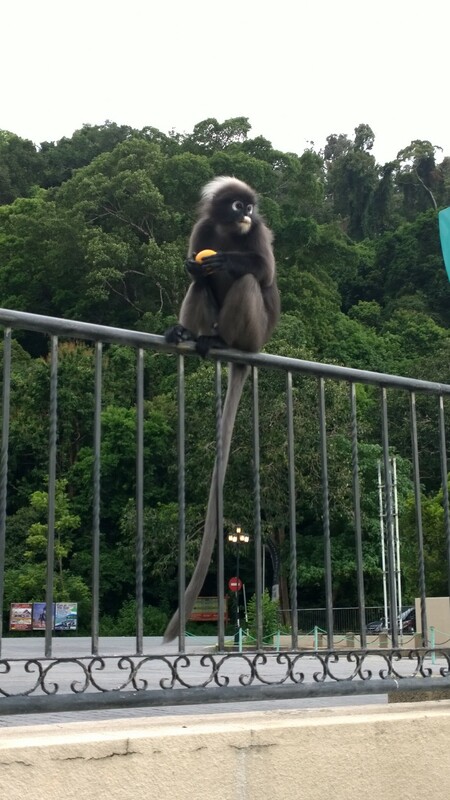 We gave oranges to the local marina monkey, who is much more gentle than the pack of crazy monkeys on the road who occasionally snarl at you and attack your car in search of rotten papayas or the stray beer. Jenna refused to let me roll down the car windows when we passed by those creatures. At one point, Hazel was experiencing so much happiness playing tag with the other three kids that she somehow lodged her leg between Sophie’s trampoline and the boat’s aluminum crossbeam. OUCH! We couldn’t easily dislodge her leg, and she was screaming in pain. I was thinking about grabbing the rigging knife (to cut the trampoline line, not her leg), but we somehow got her to wriggle free. After 10 minutes of mommy’s TLC, she was soon back bouncing around, with one more battle scar added to her impressive collection. 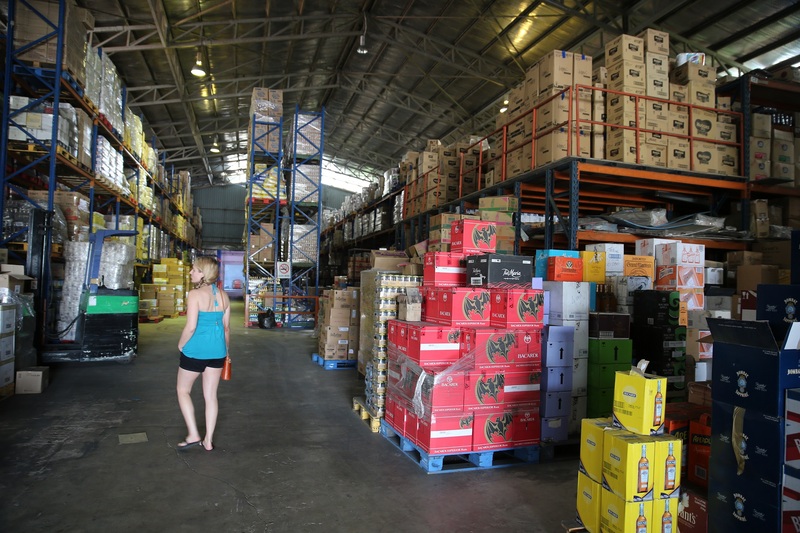 While in Telaga, we also visited the local liquor warehouse, which arguably has the lowest alcohol prices in the world. Langkawi is a duty-free zone, and this low-overhead operation is located away from the main road, behind a wet market in a parking lot situated underneath some power lines. Nothing in the warehouse is marked with a price, you simply open up a case and bring a bottle up to a shirtless Chinese man behind a desk and ask him to look up the price. A liter bottle of Bombay Sapphire gin cost US$10, and a case of Carlsberg beer cost US$12. In our travels over the last year, each of those items could cost way over US$100, so we stocked up for Misti and Abbi’s visit. But our goal was to not stay on the dock for their entire visit; we actually wanted to get out and tour some of the local islands. 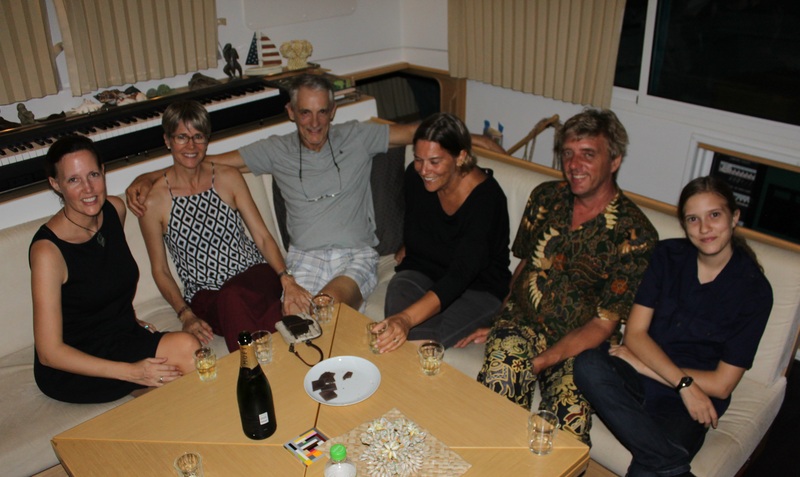 We had the crews from some of the local boats back over for one last visit, drank another champagne toast to my son Max and his girlfriend Becca who had recently announced their engagement (! ), and reluctantly sent Jana back with her family to Momo, which was going to leave for the Indian Ocean in two days. 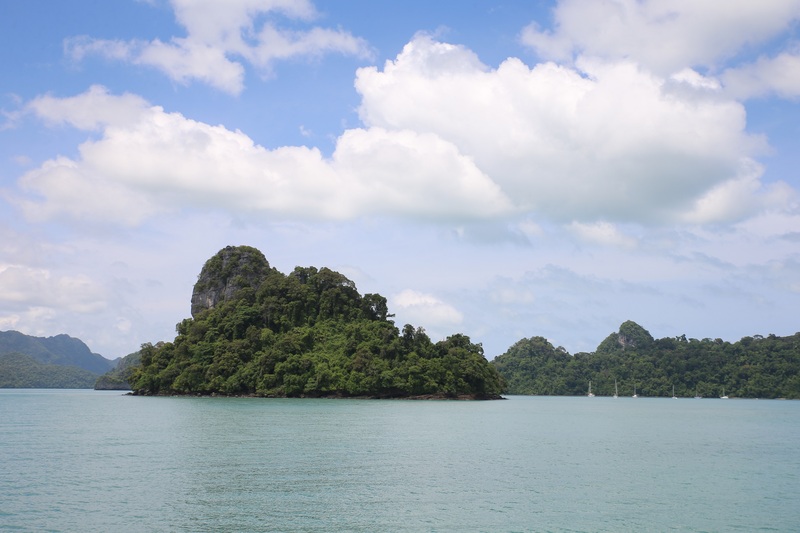 The weather had finally cleared, and our plan was to spend a week wandering over to some nearby islands around the top of Langkawi. 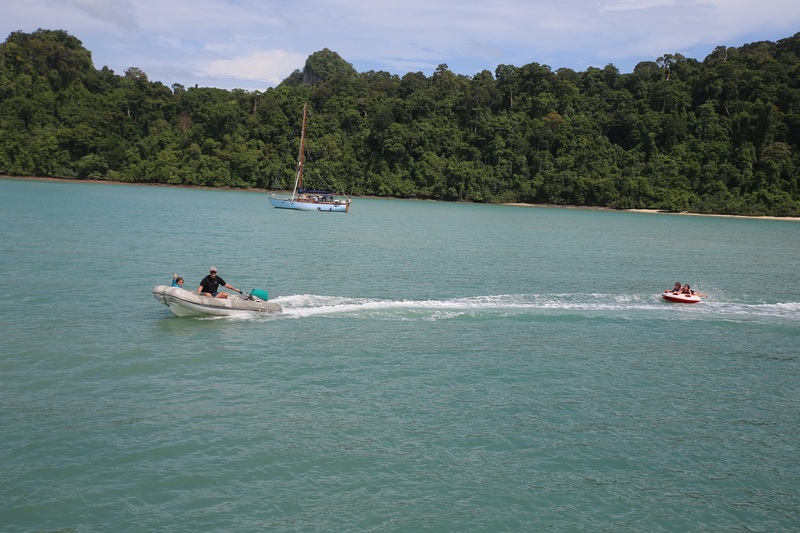 Some of these islands are part of Thailand, and we would NEVER consider going over there without the proper paperwork, even though we were told by our fellow cruisers in Telaga that boats had been crossing back and forth between these islands and Langkawi for years without going through any sort of customs formality. But within 30 minutes of leaving Telava, we were hailed on the radio by a Malaysian Navy warship that was on patrol. So much for going anywhere near Thailand. The navy was most likely patrolling the border due to the Rohingi refugee crisis. 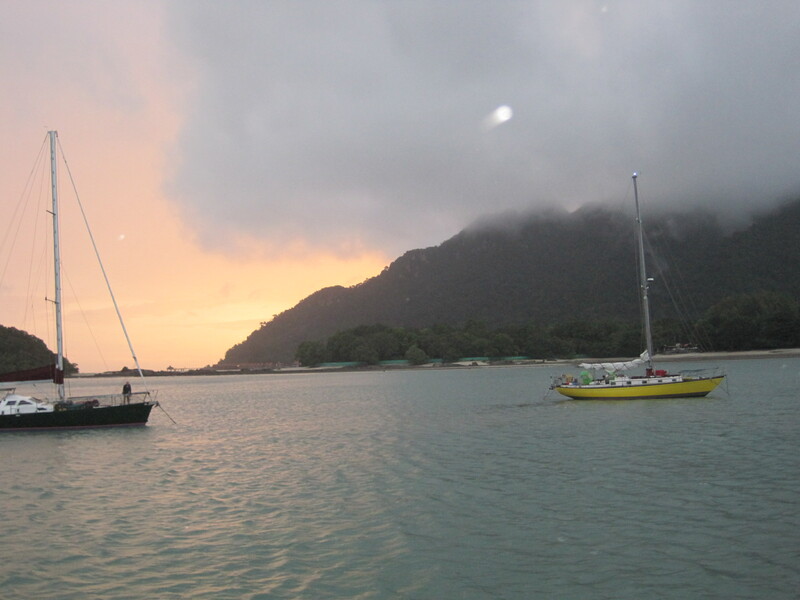 Jenna and I decided that we wanted no part of that and within a few minutes we did a 180 degree turn, unfurled the jib, and enjoyed a gentle 3 hour sail to Pulau Singa Besar, one of the Malaysian islands immediately south of Langkawi. 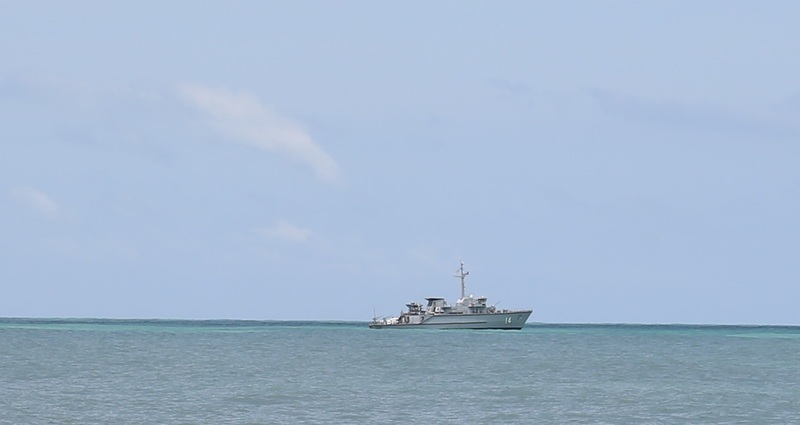 As we did so, we spotted another navy patrol boat lurking in an island cove, but they soon made steam and joined the first ship on a circuit of the border with Thailand. So for the next five days we were forced to hang out in this anchorage at Singa Besar. We tried to make the best of it. We went swimming every day, the ladies broke out the paddleboards, and I even inflated the donut and dragged happy kids through the water. Even I joined into the swimming shenanigans, because at heart I am just a happy kid. I soon got a haircut after this photo was taken. While we were there, the weather turned bad and we had a couple of days of squalls. The holding was much better than Telaga, so we weren’t scared of dragging the anchor again. We comfortably holed up in Sophie, watching movies, playing board games, eating good food, and enjoying our bounty from the warehouse. 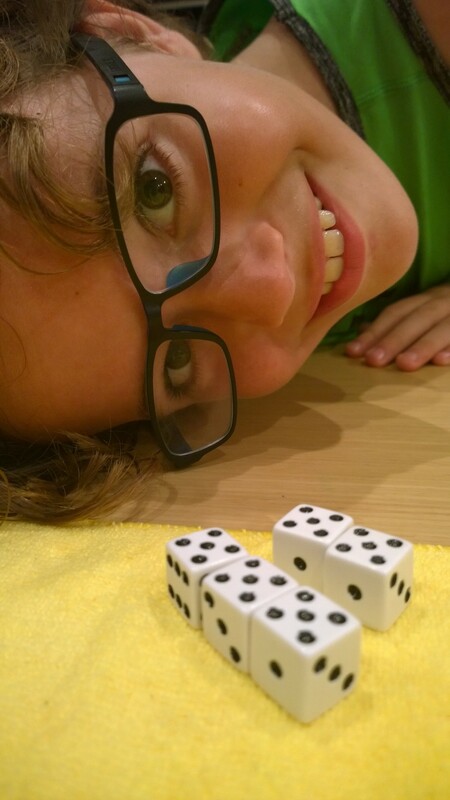 We eventually even broke out the Yahtzee. Leo crushed everyone. It made him even happier. But all god things eventually have to come to an end, and we reluctantly returned to Telaga. To the surprise of absolutely no one, we saw that Momo was still at anchor. They did not want to leave during the bad weather and were preparing to pull their anchor and finally depart within the next 30 minutes. We decided to hold an impromptu emergency sea rescue drill, simulating the transfer of key supplies to a stricken vessel. Leo did a fine job manning the supply transfer net, and if you look closely you’ll notice that the net’s contents have an anchor on its label. So that pretty much wraps things up. Momo left and then returned in an hour due to a big swell and no wind. They stayed for two more days. We successfully escorted Misti and Abbi back to the airport after a tremendous visit. Sophie is clean and happy. The kids are happy. Jenna is happy. I am happy. We’ll hang out here for a few more days, then its off for Thailand for real. We need more adventures. Jungle aardvarks? Underwater croquet? Who knows. But first, some sleep. Too much kid happiness is exhausting. 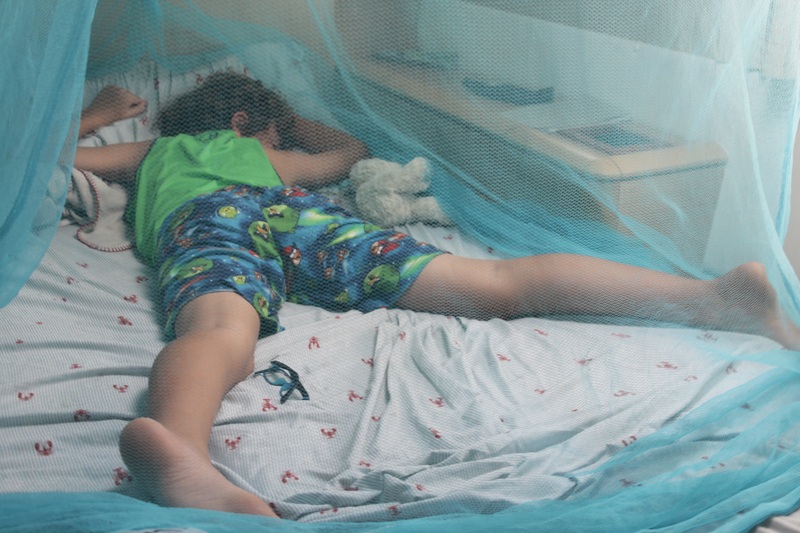 This entry was posted in Uncategorized and tagged Kids on Boats, Langkawi, Malacca Strait, Telaga by Jamie. Bookmark the permalink. 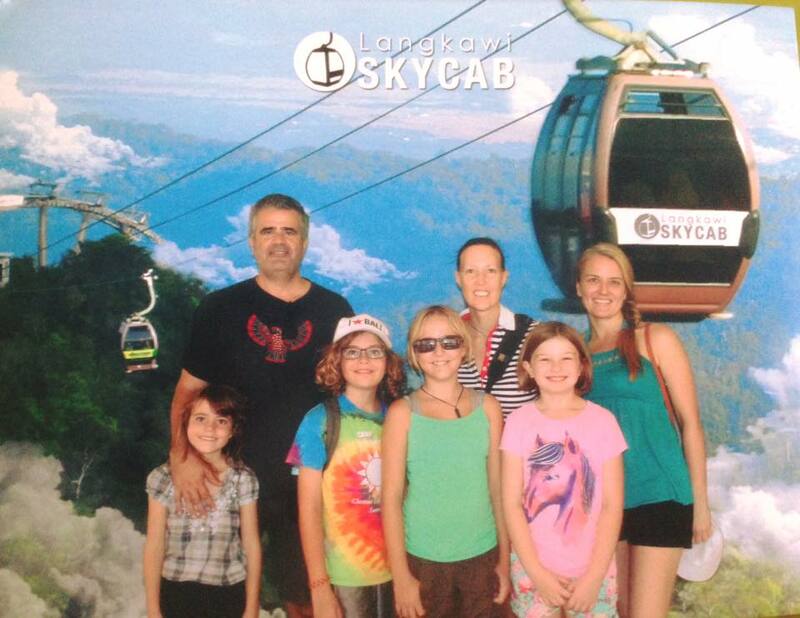 Thanks for sharing….loving your adventure! !